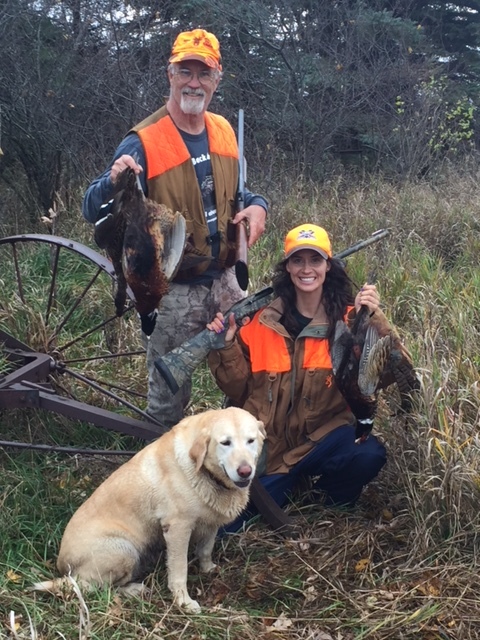 Here are a couple of photos of our pheasant hunting this year. The first photo is from opening weekend. 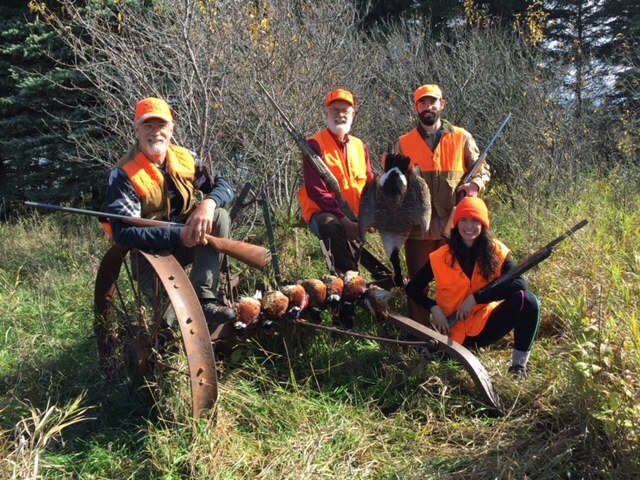 My daughter Hannah and I, my nephew Evan, and family friend Dennis Johnson hunted the Saturday opener and Sunday morning. We walked many miles, missed a few birds, and ended up with seven roosters and an unlucky Canada goose. The dog in the second photo is my yellow lab Bella. She hunts slow and close and we never lost a bird. Everyone got at least one pheasant. They were all good looking, early hatch birds from this year. We were hunting near Wilmont where I grew up and where our family still has land. We camped on an old school ground that we call the “two acres.” The campground is surrounded by good pheasant country and the birds we got were taken on public WMA (Wildlife Management Area) lands. I was the hired hand on this land a half a century ago when it was still farmed, and so I know the land well. It is beautiful upland rolling prairie, now well-managed for wildlife. The weather was perfect, the country looked great, and the birds were there if you were willing to hunt hard. The company, along with other family and friends, was great as well. A week later Hannah and I hunted the same area along with her boss Dr. Charles (Charlie) McCann. On Friday we hunted hard in winds that hit 35-40 miles per hour. The birds were wild and tough to hit, and Bella had a hard time tracking them in the wildly blowing grass. Saturday was a bit less windy, but the rain set in by noon. Another difficult day. On this weekend we also hunted on the Fenmont WMA north of Wilmont on the county line. We saw a fair number of birds and finished the weekend with a rooster for each of us and a mallard as a bonus. We had no easy shots, the birds were wild again and the wind made their flight unpredictable at best. Despite the challenging shooting opportunities Hannah made a great shot on a long-range broadside rooster in the strong winds on Friday. Charlie kicked the rooster out of a shelterbelt, it passed by me and I declined to shoot, it continued on past Hannah, and she folded him dead. I was amazed to see him fall. Despite the weather we had a great weekend and all left very impressed with the quality pheasant habitat that is returning to that part of the state. The next few weeks I’ll be turning my attention to bowhunting whitetails near home. We still have a lot of venison in the freezer after last year’s hunt, and so I don’t feel a lot of pressure to shoot does early. I’ll take a couple later for sure but not right away. I’ll keep you updated on my annual quest to take a mature buck–always a challenge. Also, mark your calendars for our gallery holiday open house on December 2-3. We’ll say more about that later. 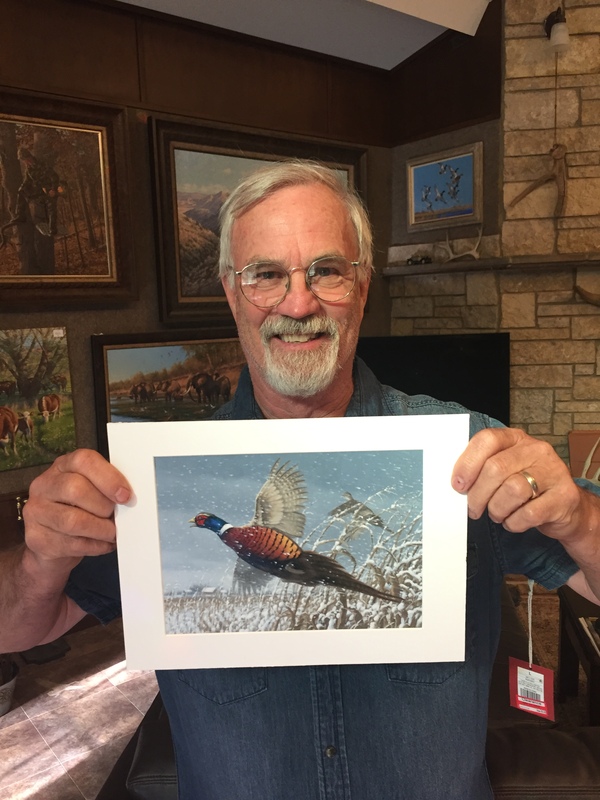 Recently I got the good news that I won the Minnesota Pheasant Stamp contest. The last time I remember that I entered was in the 1980s and didn’t win back then, so I was very pleased to get this news. I will be entering more stamp contests in the future for two reasons. The first is to practice for my entries into the Federal Duck Stamp, to develop ideas and to work on the skills it takes to be competitive. The second reason is, as good friend and art dealer Chris Knutson suggests, “to take advantage of the free publicity that goes with winning.” These stamp programs raise a lot of money for habitat and so I’m pleased to be a part of that also. A note from Juli: Those of you who know Mike personally will understand the humor in this photo. Mike put on a new shirt for the picture. Think Minnie Pearl.